Standing in the front of the gate, Alysia spoke to the gatekeeper. But he stepped back and readied the spear in his hand. That’s what you would expect because the Princess of the village was behind Alysia, who had open wings like a bat. If it was just the Princess, then there would be no problem. She could return anytime she wanted, but the problem was Alysia. Her wings oozed magic and her presence intimidated the gatekeeper. The pair, Alysia and Claire had turned their eyes to the overly cautious gatekeepers as if they saw something interesting. Such things were said by the curious pair, but it seemed like this was disagreeable to the gatekeeper. The gatekeeper lost his strength, bowed deeply to Alysia and opened the gate. This immediate change to new circumstances seemed to have been fascinating for the two, who laughed over and over. They pass through the door in the huge tree root and enter the inside of the house, where a housemaid was. Rather than a home or a house, Alysia couldn’t help but call it a castle. Ornaments placed in the vicinity, paintings hung on the wall and a chandelier suspended from the ceiling. An untrained eye would be able to understand that these were considerably expensive. Hundreds of candles which utilised flame magic had shone in the chandelier. Alysia looked around and restlessly walked through the hollowed out trees that made it look like a long walk through a corridor. It became uphill and the holes in the wall became less crowded and was also getting higher. Alysia climbed up until the leaves at the top part of the tree could be seen from the wall hole, at that place the housemaid stopped. This double door huh――So Alysia have generally guessed what was this place. Claire, who interrupted the housemaid’s words pushed the double doors open. A big, wide desk and a book shelf were lined across the opposite sides of the room. The youth sitting down in the desk would be Claire’s father, but without looking at him, Claire opened a drawer placed near the door. Without listening to the voice her father telling her to stop, the pair came out of the study with just the key. The housemaid standing by the door was surprised, but guessing the circumstances, she immediately led Alysia to the vault. When Alysia thought had been seen, the housemaid entered the study. Perhaps she could persuade Claire’s father. Embarrassed, Alysia faced downwards. When she did, Claire took her hand and they started to climb the uphill corridor. It was Alysia who said so, and retrieved a great deal of books out of the shelf. Currently, the two could call the vault a jungle of history books, especially for covering vampire topics. Alysia suggested to Claire, who pointed to a desk and sat down in a chair. To destroy the tower of books from top to bottom, they started to read. It took a while after they started to read. It was already evening and it seemed that Alysia had finally found a related book. Claire peeps at the magic circle in the book from the side of Alysia. A double circle was drawn outside a six-pointed star. 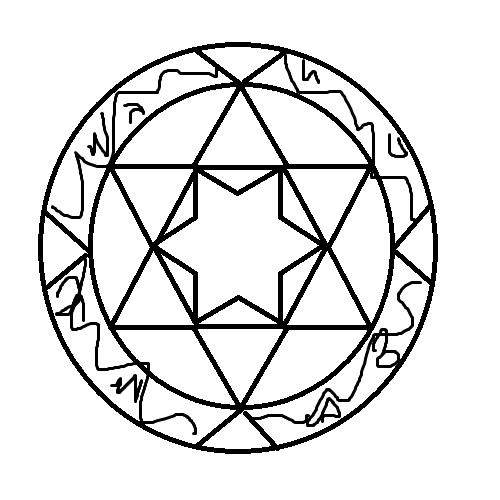 A hexagon was drawn inside that star, and to connect the vertices of the hexagon, another six-pointed star was drawn. Between the double circles were a variety of straight lines, curves, and symbols. Alysia, who tried to read and solve the contents, unconsciously turned away due to its complexity. Such a conversation was performed. Alysia, now, worked on analyzing the magic circle which she had abandoned. First, you draw the magic circle where the wings were, which would replace the substance that makes up the wing into magic, allowing for them to retract. After that, you would engrave the magic to manifest the wings on the back. With magical power it was possible to do every possible supernatural phenomenon by will power, it was possible to the extent of converting material, but that is originally accomplished using divine power. Magic power born since the creation of the world was derived from divine power, and in regards of such matters, magic power is inferior. At the dormitory room of the school, Fian was considerably irritated. It was because Alysia and Claire did not return yet. Sheriana was holding Fian. Fian turned her attention to the open window. At that exact moment, Claire and Alysia came in from the window. And the wings from Alysia’s back changed its form into magic and became particles of light. The magic started at her feet and surrounded her for a while. Then Sheriana, who was held down Fian until now, ran into Alysia. Staggering for moment with a troubled face, Alysia stroked the head of Sheriana. With the sacrifice of breakfast and the heartbreaking cries of Fian, they arrived to class in the last-minute. (Arisia) climbed up until the leaf at the top part of the tree could be seen from the wall hole, at that place the housemaid stopped. This double door huh――So Allisia have generally guessed of this place. magical power possible to do every possible supernatural phonomenon by will power, it possible to the extent of converting material, but that is originally accomplished using za zivine power ze, magic power born since the creation of the world from derivation of the divine power, in regard of such matter the magic power is inferior. Again, thanks a ton! Paint is best. This is a history book aimed for Vampire. It is said that magic square possible to store their wing, as for the data, it is recorded in it(yo). Then for the method, it manisfiested only by concentrate to distribute(<– if you know more proper word, change this) their magic power, and they should able to freely store it. Thanks, buddybuddy. Almost finished a chapter, finally!